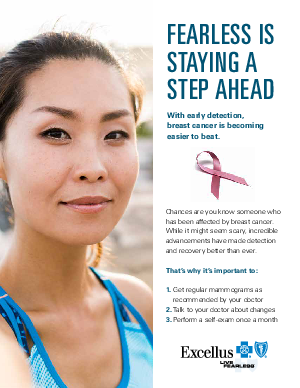 Offers > Excellus BlueCross BlueShield > Give your employees the information they need to stay a step ahead of breast cancer. This handout makes it easier for you to arm your people with the knowledge and confidence they need to protect themselves and their loved ones against breast cancer. It stresses the importance of early detection, highlighting the warning signs to look for and steps your employees can take to stay healthy. If you like this handout, you can get the full Breast Cancer Awareness Toolkit at ExcellusForBusiness.com.